Welcome back guys and gals. It was another wild week in college football. Teams lost that were supposed to win. Teams won that were supposed to lose. Some games were blowouts that were supposed to be close, and there were games that were close that were supposed to be blowouts. As always, there were people who rose above the rest and were complete studs. On the flip side, there were people who shriveled under the pressure and played terrible. It’s time for this week’s edition of Studs and Duds. If you look at my four preview games you will see that I went 3-1, a very respectable mark. But, if you follow @4_DownTerritory on the Twittersphere you will see that I went an extremely impressive 0-6. You know what the chances of not picking one game right are? The exact same as picking them all right. So if you look at it, it’s actually a pretty impressive accomplishment. I WENT 0-6 IN THE PICK SIX GAMES POSTED ON TWITTER. NOT ONE WIN. DO I NEED TO SAY MORE? WHY AM I YELLING? I stated in my preview for this game that there would be plenty of rushing yards in this game. No one could have guessed that there would be this many. 408 yards rushing is an insanely large amount of yards for any team. But Mr. Gordon got 408 by himself and only on 25 carries leading the way for the Badgers to rack up 581 yards on the ground. With Dak Prescott stumbling in Tuscaloosa, Melvin Gordon has launched himself to the top of the Heisman talk. We all know the Auburn defense isn’t the best. They give up yards and points, but get enough stops to let the Auburn offense control games and get wins. After giving up over 400 yards on the ground to Florida, I fully expected the Auburn offensive attack to tear the Dawg D apart. Wow was I mistaken. An offense that has been dominant all year struggled to 292 yards of offense and only 7 points. Malzahn better get the Gus Bus back on track or it might be ugly in Tuscaloosa in two weeks. 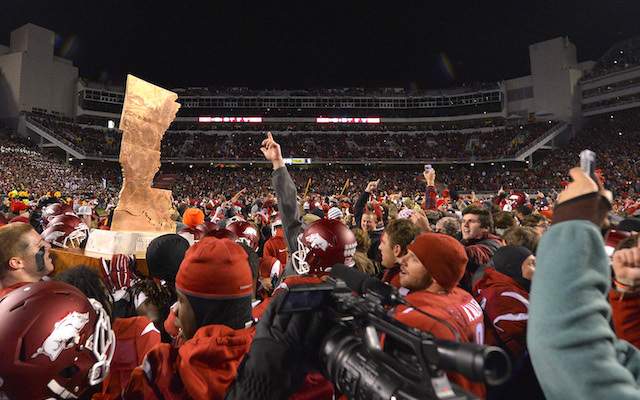 The Razorbacks finally got off of the 0-fer train this week with a 17-0 win over rival LSU to take the Golden Boot back to Fayetteville. There was nothing about this game that was really studworthy. The offense was terrible again. But anytime you hold someone to 0 points it is impressive. The reason Arkansas makes the list is because this is their first win over an SEC team since the Chizik administration in Auburn, gas was $3.60 a gallon and Argo was the top movie in the box office. So golf clap to you Arkansas. Way to finally get a mark in the W column. With the previous stud you should see this coming. Anytime you are the team that has a 17 game conference-losing streak broken against you, you land on the Dud list. Not only that, the Bengal Tigers were just flat out terrible. 36 yards rushing. 87 passing. Those stats are fine for a quarter. Not an entire game. The aforementioned Melvin Gordon had nearly 4x that by himself. If that doesn’t make you a Dud, then I don’t know what does. On behalf of 4 Down Territory, I would like to officially nominate J.T. Barrett for the Heisman trophy. I’m not saying that he should win it, but he should definitely be in the discussion. This weekend he threw for 200 yards with 3 touchdowns and rushed for another 189 and 1 touchdown in conditions that can only be described as miserable, at best. 15 degrees with wind and snow sounds like no fun to me, much less playing football. I am very intrigued as to what will happen next year when Braxton Miller is healthy and how Urban Meyer will use his two dynamic quarterbacks. Everyone expected the Sun Devils to roll into Corvallis, Oregon and take care of business. They were the hot, up-and-coming team in the playoff talk facing a 4-5 Beaver team. Well consider any chance of making the Final 4 over for the Sun Devils. 367 yards and a loss to one of the Pac-12 cellar dwellers is not a good way to make an impression on the playoff committee. I guess it’s time to go ahead and start booking flights to the San Diego Credit Union Poinsettia Bowl, or some other bowl game with a ridiculously long sponsor name. Or just stay in Tempe since ASU is consistently in the top 5 for best party school in the country. That’s got to count for something right?